Officer Candidate Schools (OCS), or Officer Training Schools (OTS) for Air Force personnel, prepare potential commissioned officers for a career in the military. Courses generally cover basic military training, leadership development, and physical training. These schools vary in length depending on the branch of service, but typically last between nine and 17 weeks. 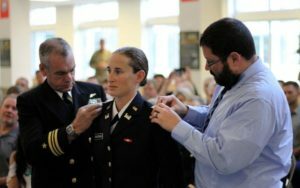 Attendance at an OCS/OTS is limited to civilians who have a four-year college degree, enlisted service members with at least 90 hours of college credit who are transitioning into officer roles, and Direct Commission Officers. Learn more about each branch’s specific school below.